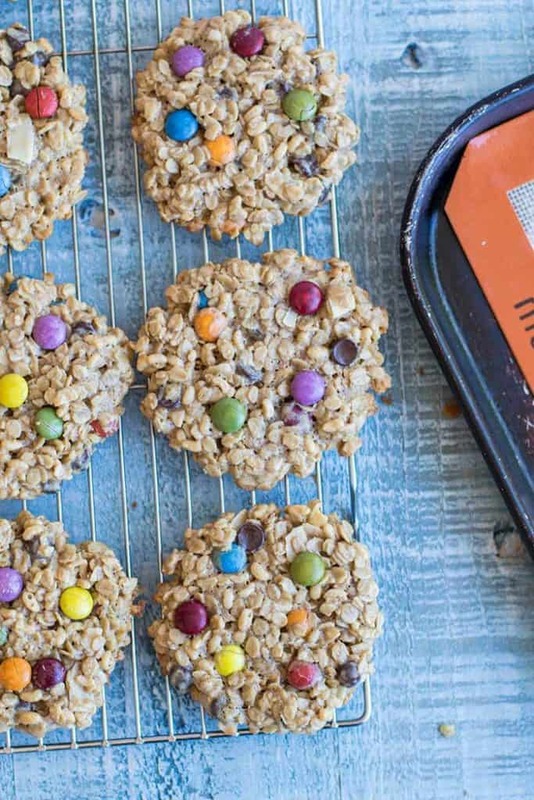 These Monster Cookies are nut free and gluten free, and make a healthier classic Halloween Cookie. 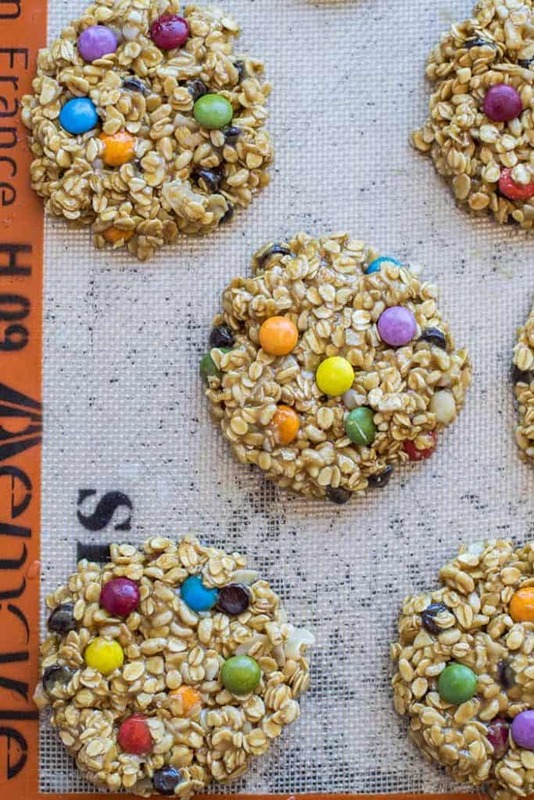 Traditional Monster Cookies are flour free, made with peanut butter and oats, and these sub sunflower butter and cut the sugar way down. We love cookies in this house. Like, really love cookies. There are always cookies in the freezer. We eat them almost every single day. With almond milk, with coffee as a mid morning snack, with a cup of tea in the afternoon. 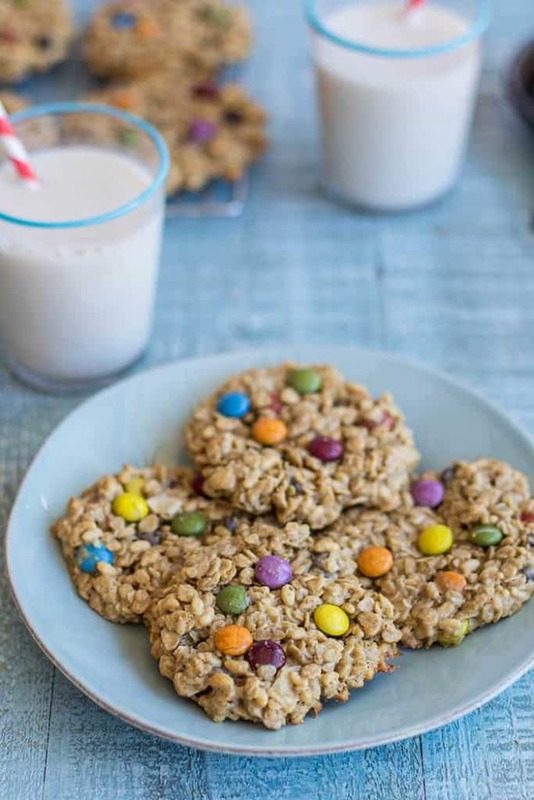 My son refused to eat his quesadilla and veggies for lunch today — but I needed to finish the video for these cookies, and how could I make him pose for the video holding cookies, and then not allow him to eat one? So yes, cookies for lunch on occasion. Cookies made at home are so much different than the cookies you buy at the grocery store (or in the bakery). First off, my cookie recipes always start with whole grains or almond flour. Not a bit of white, refined grain flour in my kitchen. 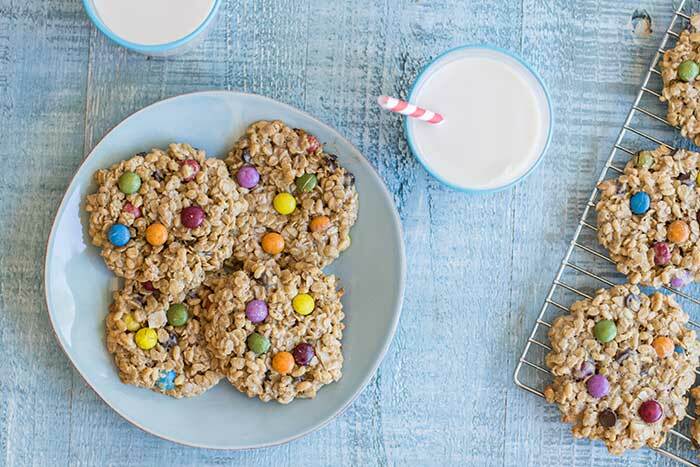 These oatmeal monster cookies are especially fun (and easy) to make because they are flourless– like the traditional recipe, they start with nut butter as the base (I used sunflower butter to make them nut free, but sub peanut butter if you’d like! ), and then come together with whole grain oats, chocolate chips, and chocolate drops. A store bought cookie not only has refined flour, but refined sugar. Loads of it. And then add chocolate drops — most would be artificially colored, meaning even more ingredients to be leery of. 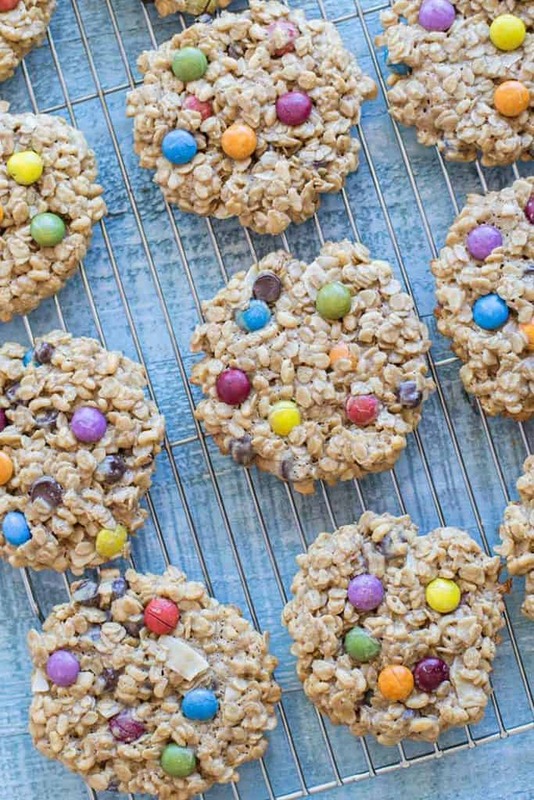 These cookies — while definitely a sweet treat, are whole grain, low in overall sugar (by comparison! ), and have naturally dyed chocolate drops, meaning cookies for lunch once in a while aren’t going to hurt you one bit! 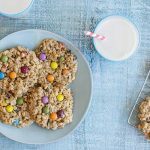 Last year around this time, I wrote about food allergies in children (and what this means for taking baked goods into your child’s classroom) and posted a nut free Irresistible Chewy Granola Cookies recipe. If you’re wanting an even healthier everyday cookie, check those out! 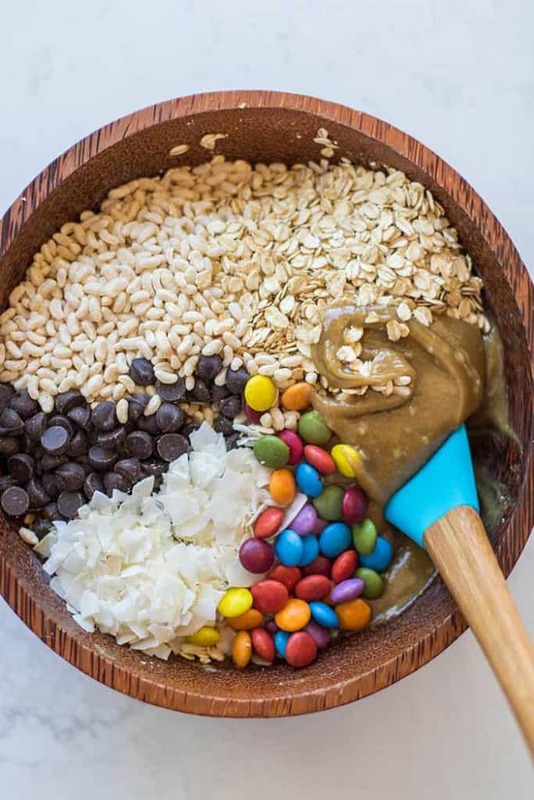 I used Sunspire Chocolate Drops in place of traditional M&Ms in this recipe to avoid artificial dyes. As a bonus, they are also made with more natural forms of sugar. These you can find in the health food sections of stores, usually sold in bulk, or on Amazon. Make is Gluten Free: Be sure to use gluten free rolled oats for this recipe to keep it 100% gluten free. Substitutions: Feel free to use almond butter or peanut butter in place of the sunflower butter in this recipe. If doing so, replace the baking powder with 1/2 teaspoon baking soda. This gluten free and nut free version of the classic Halloween Cookie is sure to please everyone! Lower in sugar, and full of whole grain oats and sunflower butter for a higher protein option. Add the sunflower butter, coconut oil, honey, egg, vanilla, sea salt and baking powder to a bowl, and mix together well until creamy. In the same bowl, add in the rest of the ingredients. I typically add 1/2 of the chocolate drops, then use the rest of them to decorate the tops of the cookies. Mix together the ingredients until all are wet. Use a 1/4 cup measuring cup (dipped in water first) to scoop out cookies. I slightly under fill the cup, and end up with 10 large cookies from this recipe. These cookies will not spread very much, so using wet fingers, press the cookies down into a nice cookie shape. Use remaining chocolate drops to decorate the tops. Bake for 10-13 minutes, until brown around the edges. The cookies will look under baked and shiny in the centers, but firm up well once they have cooled. Store in the refrigerator or freezer for several weeks (or longer) in an airtight container or freezer ziplock bags. These cookies hold up well at room temperature and are a great lunch box treat option. I prefer not to give my son candy with artificial dyes. Artificial dyes are not only linked to food allergies, but skin conditions and behavior problems in children. If you’re interested in reading more about Food Additives to Avoid, download my Nix List here. But of course, kids love the candy coating on chocolates! I give my son 85% dark chocolate at home, or Enjoy Life 70% dark chocolate chips, and he loves those – unless something reminds him of M&Ms and then it’s all over. I buy Sunspire Chocolate Drops to mitigate that problem- they are dyed with all natural ingredients like beet and turmeric. These are what generally is sold in bulk in the health food sections of stores and at Whole Foods. You can also order them on Amazon! Thanks Tiago! They are delicious. I think I am going to grab one right now to have with my coffee.. while my son is at the park and won't ask for one too! Monster Cookies I realized were delicious, already imagining here serving with a very warm coffee must be wonderful, I loved the article. Yum, with coffee -- or tea, or almond milk. They are delicious any way! Ooh, they are so awesome! Thanks for letting me know. I’m making these again. I made them for some friends of mine last weeks and they loved them. They are a wonderful.